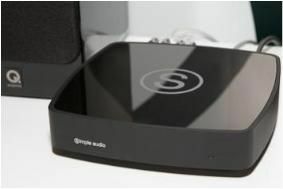 Manchester Show 2011: Simple Audio multiroom system due on sale in December | What Hi-Fi? It's been a long time in development, but the Simple Audio multiroom streaming system should finally hit UK dealers in December. Word on the floor here at Manchester, where Simple Audio is exhibiting, is that production will begin next month. The company has already signed up 26 UK dealers, with an additional 24 due to come on stream post launch. If you want to hear the system in action, pop down to the Manchester Show this weekend, where you can find Simple Audio in the Medici Ballroom at the Renaissance Hotel. We've asked for a review sample and will bring you our full verdict just as soon as we get it into our test rooms. Simple Audio, the company founded by ex-Linn employees to develop a new PowerLine multiroom audio system, has launched a website giving more details of the product. Head on over to www.simpleaudio.co.uk and you can discover who's behind the company, how the system will work and the range of products it will offer. Initially due for launch this summer, we now understand Simple Audio will arrive in the UK this autumn once a distriibution deal has been struck with retailers. To watch our video news report on the Simple Audio multiroom player, click here. Now this looks interesting: it's the forthcoming Simple Audio player, a high-definition multiroom audio system coming out this autumn for around £650. Unlike wireless systems such as Sonos or Apple AirPlay, it uses PowerLine AV connectivity and wired ethernet to distribute music via your mains wiring network around the home. This is said to give a more robust connection than wireless systems, and allow the transmission of 24-bit audio files. The Simple Audio player can play back music from your iTunes library, internet radio, internet music services or attached devices such as an iPod/iPhone or TV. There's support for MP3, AIFF, FLAC, WAV, AAC (MPEG4), Apple Lossless and 24-bit audio. Inside is a stereo amplifier, so all you have to do is connect a pair of speakers to each player. Line input/output phono sockets, a front-mounted line in socket, USB terminal, optical and electrical digital outputs, subwoofer out and headphone socket are all included.